This past weekend was a very special one for my family, and even though Layne and I weren't able to attend, it is definitely something worth mentioning on my blog. This year my cousin Matthew graduated from Holy Cross High School. Growing up in New Orleans, where you went to high school is a big deal. There are private schools, there are public schools, and then there is the Catholic School league. I chose where I wanted to go to high school. My mom and aunts went to the Academy of Holy Angels, but by the time I was old enough the school had closed. So I chose Mount Carmel..... and then all my cousins on the Reynolds side followed... Abby, Claire, Erin, and Katie. But that is nothing. I'm an Orkus/Reynolds, and the truth is that we bleed blue and gold. Although my paternal grandfather didn't go to high school, he has been initiated into the Holy Cross Hall of Fame. My Dad went to school there, along with his brothers Billy, Michael, and Jerry. And my cousins Phillip and Josh did too. But the picture above represents the Reynolds side of the family. My maternal grandfather graduated from Holy Cross in 1946. My mom married a HC man, and so did my Nan and Aunt Ellie. That was in the 70's. (Holy Cross is where my dad met my Uncle Scott Armstrong.) My mom's brother went to school there too. And then came the 90's. 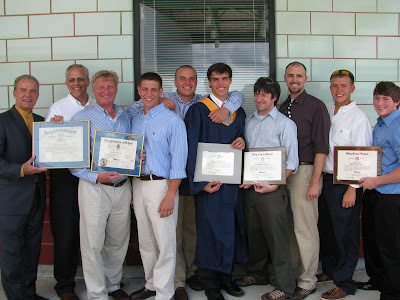 The four Armstrong boys went to Holy Cross, and Chad Huth did too. Stephen and Gregory, Paul and Ted Reynolds, and Jeff Poche' all graduated from Holy Cross, and now, another decade is complete. Matt Poche' graduated on Saturday. Congratulations Matthew! Congratulations Nan and Po! And a special thank you to my family, who sacrificed time and money to give us the education we had. There is a reason we value tradition... and it's because of you.